The only reason I didn’t given this memoir five stars in GoodReads was because I wanted more. 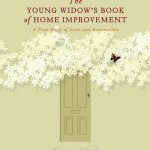 The Young Widow’s Book of Home Improvement is both a love story and a memoir of loss. There are no surprises: it’s all laid out in the title. The author Virginia Lloyd falls in love and discovers too soon that the illness which her beloved is being treated for is terminal. The memoir alternates between “after” – young widowhood – and “before” – courtship and newly wed. The pivotal moment is the death of John, Virginia’s husband, way too soon at the age of 47. But death isn’t the book’s theme. The book sings of love and grief, with a persistent chorus to cherish what one has while it lasts, to make the most of each day. I started this book on Sunday morning and wished I hadn’t as I had to go out and wanted to keep on reading. On Monday morning I read it – weeping – on the bus on my way to my sister’s birthday lunch in the city. I had to force myself to shut the book before I wanted so as to leave time to recover and greet my sister without tears. I finished it last night and wanted to email Virginia at once to tell her how much I loved her story, how it had moved me. But how can you send an email like that to someone who has lost – and written about so beautifully – the love of their life? Besides, I felt angry. I wanted more of John. I wanted to get to know him better before the book’s pages closed. I wanted to hear him laugh, listen to the music he enjoyed, see the photos of his travels, get to know more of what made this Irish man so special to his wife, his family and many friends. That’s the brilliance of Lloyd’s book. She doesn’t just depict her grief, she creates it in the reader – she carries the reader into her heart, sharing with us her grief at not having had enough time with someone special, to live and love, to celebrate and explore, before it’s all over and you’re left with only memories. Reviewed as part of the Australian Women Writers Challenge 2012. Disclaimer: I read and reviewed this before Virginia agreed to represent me as my literary agent. I’ve read other good reviews of this book … it’s one that I’m sure would interest me. Have you read Joan Didion’s The year of magical thinking? Also about the loss of her husband. A great read. 47 … too young. Thanks, Sue. I’m sure you’d enjoy it. It’s beautifully written and so moving. I haven’t read The Year of Magical Thinking, but I do remember it being talked about – I was probably head down with my own writing at the time. Thanks for the recommendation. I’m mentoring someone who’s writing her memoir after being widowed: she might find it a consolation. She might … Also Halligan’s gorgeous novel Fog garden. Clare isn’t me, she writes, but we all know that her feelings mostly are. A pleasure … All in the service of good reading, eh?